WALTHAM, MA (November 9, 2018) — RTN GoodWorks Foundation has donated $4,467 to the Greater Lawrence Disaster Relief Fund to support relief efforts following the September 13 gas explosions in Lawrence, Andover and North Andover. Funds collected in RTN Federal Credit Union branches totaled $2,233.62, with the Foundation giving a matching donation. 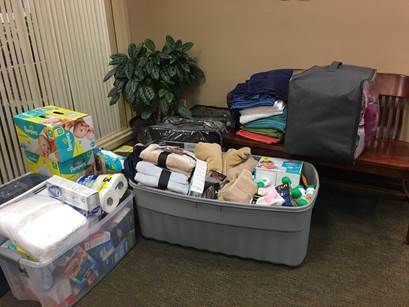 Items collected in RTN branches, ready to be delivered and donated to the Lawrence Senior Center in late October.